Unique waterborne, high gloss, solid covering, acrylic colors can be used on any interior/exterior properly primed white surfaces requiring high-visibility, such as signs, painted bulletins, exhibits, safety markings, and more. 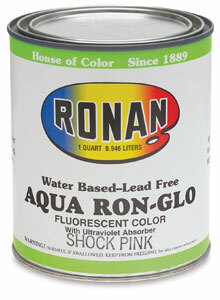 Daylight fluorescent colors are water-based and lead-free, with ultraviolet protection. Colors dry quickly to a bright, flexible, durable, weather and fade-resistant, velvet finish on wood, metal, Fiberglas®, many synthetics, treated vinyl, and many other materials. For brush or roller application.